Former federal Labor Party leader Mark Latham had one of his regular embarrassing rants in The Financial Review on Thursday spinning the truth as per usual in an attempt to defend Julia Gillard in the AWU fraud. Latham is one of the best things the Liberals and other political parties have going for them. Latham is also extremely disliked by many if not most in the Labor Party. A lot of it has to do with his infamous book The Latham Diaries where he unloaded on many past and present in the Labor Party. And who can forget the day Latham “stalked” Julia Gillard and telling voters at the 2010 election to leave their ballot papers blank. Not exactly an endorsement of his own party. (Click here to read more) That might explain why he is now grovelling to Julia Gillard so he can curry favour with the Labor Party and get back on the financial gravy train of political appointments to boards etc. Mark Latham wrote an article on Thursday attacking Michael Smith and his investigation of the Julia Gillard and AWU fraud. The net effect is that Latham is also attacking the Royal Commission and the police investigation that is currently afoot in Victoria. I do not have an issue with Latham questioning Smith as I have in the past (Click here to read) and the attack on Michael Smith is Smith’s problem which he has returned serve. (Click here to read). But you cannot question the vast evidence that Smith supplies as it is documented and Latham likes to ignore the documents as they undermine his arguments. Unless of course you are going to say the documents were forged and at this stage no one has and I doubt that anyone will as a lot of the documents come from court and police files etc. The title Latham gives the article is “There is no trail that leads to Gillard”. Well I suppose he is right, it isn’t a trail at all, it’s a 10 lane Highway. In the first three paragraphs that makes up about a third of the article Latham does nothing more than attack Smith which undermines Latham’s whole article. The public record is strikingly clear. There is not a single document from the 1990s that incriminates Gillard. On the available paperwork, she provided valid legal advice and paid for her home renovations via personal cheques. By the standards of his police training, Smith has come up empty-handed. Mark Latham claims to have researched the AWU fraud and then makes the statement that “There is not a single document from the 1990s that incriminates Gillard.” One example of an incriminating document which received substantial mention at the Royal Commission is Julia Gillard’s handwriting on the application to incorporate the association that was used to funnel the stolen AWU funds through and the document is full of lies. So Latham is either incompetent or deliberately lying to his readership and either way he should not have his job. When Latham attacks the evidence in regards to Julia Gillard’s involvement in the AWU fraud he is attacking everyone who has shined a light on the AWU fraud and wants it to be fully investigated. That includes this site and many of the followers and anyone who is fair-minded and has a reasonable knowledge of the AWU fraud knows that Gillard is in a lot of trouble. Mr Latham is another online (and print) troll that the Labor Party have set-up to defend Julia Gillard and the Labor Party’s history. His payback will probably be a directorship or two when the Labor Party is back in power. The vast majority of what Michael Smith writes in relation to the AWU fraud cannot be questioned as there are documents to support it. But Latham is happy to ignore the documents and the majority of what is said at the Royal Commission. In 2001 Latham broke the arm of a taxi driver but was never charged with an offence. (Click here to read) In 2006 Latham “escaped a criminal conviction after pleading guilty to maliciously damaging a news photographer’s $6,700 camera.” “But the former prime ministerial aspirant was placed on a two-year good behaviour bond” (Click here to read more) Latham has always been a bully boy and the handshake where he clearly tried to intimidate John Howard helped him lose the 2004 election. The Australian public do not like bullies and almost every article Latham does on the AWU fraud he attacks Smith or other journalists which shows he is up to his old tricks of trying to intimidate. Latham has always seemed to think he is above everyone else and can do what he wants. It is really time for Latham to retire from being in the public. He is of no value to anyone and is trying to undermine the Royal Commission and democracy for his own gain. I raised Labor Party online trolling in the last post to a degree and when you put that together with the above you can see it is starting to become widespread. The political party’s have to use the media including the internet to get their message out to the voters. The downside is if they do it in a dodgy manner it will backfire fast as the online community will respond quickly. The Labor Party are shooting themselves in the foot like there is no tomorrow with Latham and crew online. Latham is a major liability for the Labor Party and they should get rid of him, then again maybe he won’t go so they can’t. Fairfax Media should definitely sack Latham as he discredits the paper and website unless of course they put his articles in the fiction section then it is OK. Passing off political propaganda that is designed to conceal crimes does no news organisation any good. When people deliberately undermine a Royal Commission and/or a police investigation they are attacking Australia’s democracy and that is what Mark Latham is doing. He is a disgrace and should be looked upon as such. 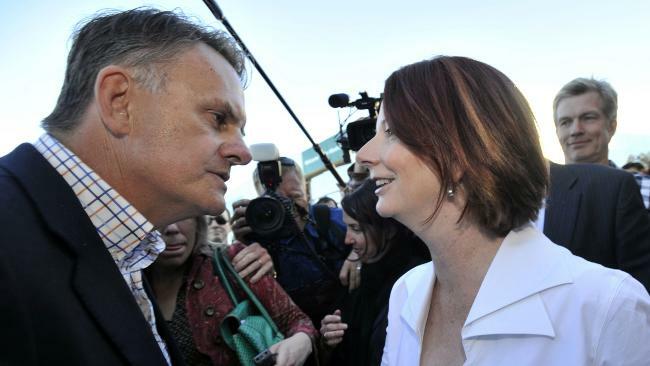 IT IS A FACT THAT LATHAM COULD NOT STAY IN THE SAME ROOM AS GILLARD, THEY HATED EACH OTHER. I AM SURE THAT HATRED WAS COMPONDED WHEN GILLARD GOT THE PRIZE THAT ELLUDED LATHAM. SKY WAS FORCED TO DUMP HIM DUE TO VIEWER OUTRAGE AT HIS DISGUSTING BEHAVIOUR. WHAT HE IS ACTUALLY DOING IMO IS GIVING THE AWU SCANDAL MAXIMUM PUBLICITY. ALSO, HE IS KEEPING HIS NAME FRONT AND CENTRE. LATHAM IS NOT THE ONLY ONE SHOWING CONTEMPT OF THE RC JON FAINE THAT VERY SCRUFFY RADIO HOST IS BECOMING INCREASINGLY HOSTILE TO ANYONE DARING TO SUGGEST THAT SAINT JULIA GILLARD HAS DONE SOMETHIN WRONG. Well said, Shane. Accurate and to the point. Mark Latham is a vile creature, simple as that. His reporting on the union royal commission has been disgusting. Latham has deliberately misled the Australian Financial Review and it’s readers by protecting the labor party & Julia Gillard. His motive is simply getting the labor party back in power, which could be a hard thing when the Royal Commission is finished. Fairfax must sack Latham immediately because he will spread more and more lies in his columns. Latham has no respect for anyone, only for himself. In the end nearly everyone will wake up to Latham and realize his columns & opinions will have absolutely no credibility, plus everyone will have the opinion he’s a liar. Latham is a bitter & twisted man who won’t realize he failed in every aspect when he was the labor leader. That’s part of his motivation of his constant dribble of his columns I believe. Bloody Latham, what a serious twit, liar, completely up himself. One of the morning TV shows has him on with Kennett sometimes. He is an absolute joke……but is also good news for the Libs as, surely people can see what a buffoon he really is?…or can they? God help us if they think he’s fair-dinkum!!! Maybe Latham is a demented dribbler, but at least he called that bunch of dogs in the ParliamentÂ by their real name” DOGS. I bought his book and thought he was dead on the money and that it was always going to look bad slagging off so many people, but I don’t think he was telling any lies, not that I am a Parliamentary insider!!! G’day Shane, I used to quite like Mark Latham as I thought he was like a breathe of fresh air when first appointed Labor Leader and I’ll admit to having a bit of a giggle over that hand shake. I could never stand that vile John Howard. But I now have to admit that Latham is a disappointment at best and a grub at worst. Diehard leftiods don’t understand the meaning of ‘grace’. and therefore feel no dis-grace. There’s a Labor troll on Mike Smith’s site using the moniker Ted Hartford. I have suspected this is Latham. I’m not saying I’m right, I could be wrong, I’d give it 50/50 odds. He sounds like Latham and just as stridently defends the indefensible. He has his backside handed to him in shreds by the other posters there every time he writes something. So failed was latham that he now writes a column for the Financial Review? Exactly what does he know about and I suppose taking a lead from the name of the publication ‘Financial Review’ What does he know about financial…review. All he wears around his a neck is a card with a bloody great ‘F’ on it! The Australian people have been, and continue to be in a very dark place in terms of the caliber of the politicians we have. Decent honest people are reluctant to go into that kind of toxic environment but things have to change. The behavior of many of these people is simply shambolic and we are expected to just sit back and accept it. Latham implies in his article that the witnesses all have such similar testimony, that it’s a conspiracy against Gillard. So I guess he should write to the Child Abuse Royal Commission then and let them know if three or more people have similar stories to tell about a priest or a scout leader they should ignore them as they are obviously conspiring together to damage the person. I guess it never occurred to him that when multiple people tell the truth it is going to sound very similar. Yes, just like the victims of the modus operandum of Rolf Harris. Latham is better suited to standing outside a night club beating up patrons. He was and is a blight on Australian politics. This recent denial of all the facts in regard to Gillard is yet another piece of garbage to add to the enormous pile he has already produced. Following Mark Latham’s article in the Financial Review I immediately cancelled my subscription to that paper. For far too long that paper has allowed this bully to carry on with his rantings and his illusionary views on a number of subjects. He was not taken seriously when leader of the Labor Party, widely criticized by all for his actions and deeds. I don’t think that many in the Labor Party would welcome him back. Truly a fool and a low life. The more people that wake up to the garbage some papers allow to be printed as “fact” the better off we will all be. At present we have a very limited scope of papers that can be trusted for fact checking and Fairfax does not appear on that list. They are a shell of their past. Mark Latham has become the modern Bob Ellis in his rantings. If you want to know why things appear they way they are, you can’t go far wrong following the money trail. Latham says there is no evidence linking Gillard to any crimes. If I remember correctly didn’t a lot of evidence relating to the AWU SCAM disapear from Slater and Gordon’s offices? It didn’t disappear and is currently being held pending the final ruling of the courts. It has already been inspected by one magistrate that ruled that each piece was created in the furtherance of a fraud and the LPP did not apply. The appeals judge has already released all the affidavits from the original trial to the public and will no doubt soon release all the documents as well to the VicPol investigators. The day that happens Gillard will probably hand in her passport and return to Wales never to come here again rather than wear the orange overalls she deserves..
My sympathy lies with those who put their faith into these Corrupt Unions in the belief that these organisations would do the right thing by them. All that has happened to their money is to lift the life style of these thieves and criminal leeches. The worker has been deceived by the very core of the Labor Party, The Union set up to presumably protect their rights. Every last one of these criminals should end up in gaol, how ever the ICAC was set up to protect the guilty and sink the innocent.